NOT REFUNDABLE: CHOOSE ONEI understand that create your own items are non-refundable. 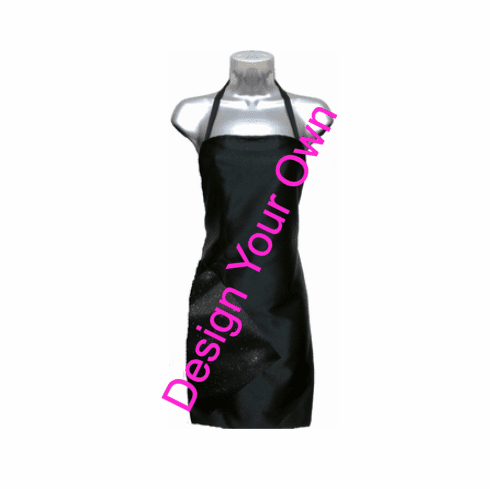 Our Designer aprons is made of a double layer of synthetic material for maximum protection and durability. Because the salon apron is not cotton, there is no need to coat it with plastic. "WATERPROOF and STAIN RESISTANT: Our designer salon apronand stylist aprons are sealed with silicone. This is the same type of application that is used by Snowboarders to keep their clothing dry. Because the hair salon apron material is synthetic, hair color does not stain. As all hairdressers know, you can't color or bleach synthetic hair. The same principle applies with our aprons, whether regular or plus size. WATCH STAINPROOF STYLIST APRON VIDEO DEMO" "
+You can throw your salon apron in the dryer, but it will last longer if you hang to dry your stylist wear. +Because this stylist apron is made of a synthetic fabric, and treated with a sealant, the salon apron is waterproof and stain resistant.